How Do You Solve a Problem Like The Drag? 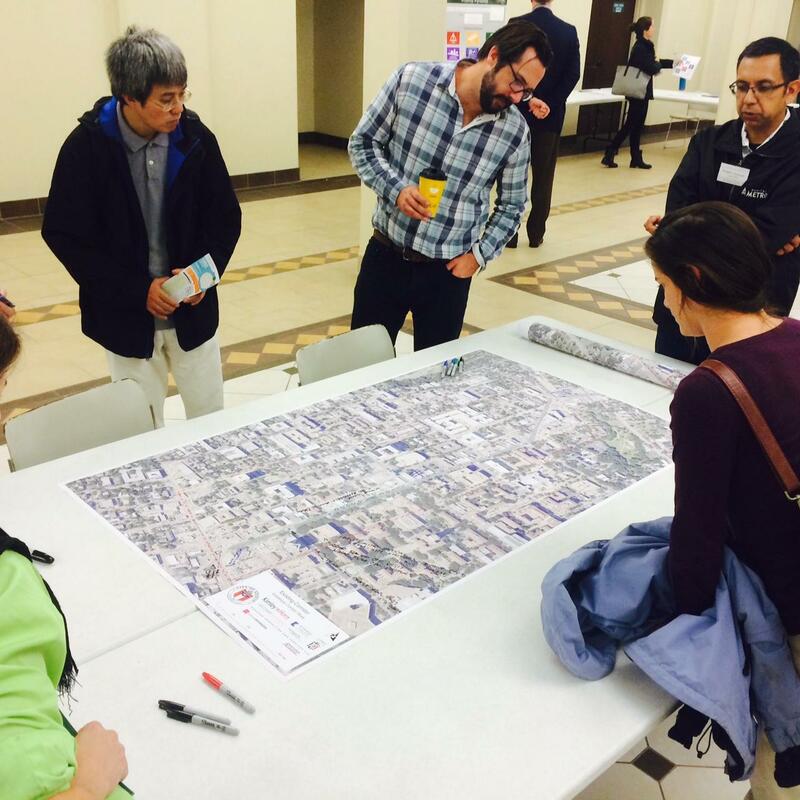 At a recent open house on how to improve the Guadalupe corridor, known as 'The Drag,' attendees annotated large maps with their ideas and concerns. It’s one of the biggest bottlenecks in town, a place where cars, buses, bikes and pedestrians all squeeze into just four travel lanes, and where the University of Texas begins to merge with downtown – a street aptly named "The Drag." During some rush hours on Guadalupe these days, it seems like it's almost faster to walk between stops than it is to ride the bus or drive in your car. Just ask John Laycock, a member of the grassroots group AURA, which advocates for more and better housing and transportation in Austin. Recently, Laycock decided to test which was the quickest way through the Drag during rush hour. The fastest option? An early 19th century technology. "The bike won, easily!" he says. "And then the bus came in second, by a longshot. I have a disability, and I walked about as fast as the cars. So, yeah, it's a little ridiculous here." So what do you do about it? How do you solve a problem like the Drag? 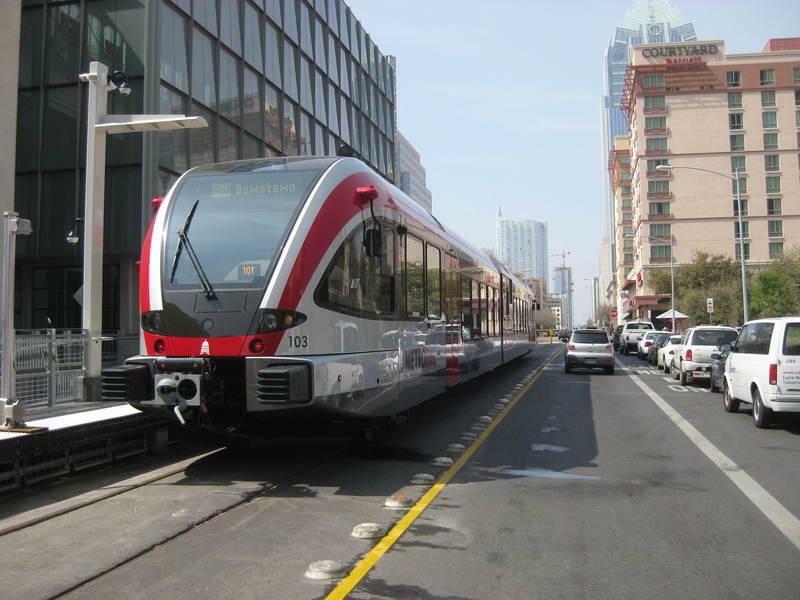 "The whole idea of this study is to look at what we call 'Complete Streets,' taking care of all of the users," says Alan Hughes with the Austin Transportation Department. 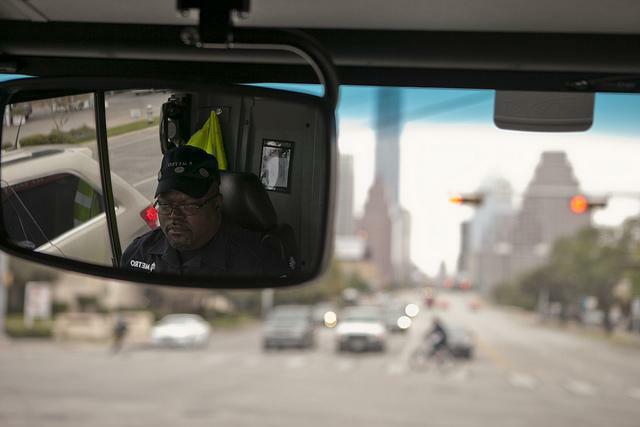 He's steering what the city calls a corridor study. It's an in-depth look at the Drag and how people move through it, and how to make it safer, and hopefully a little faster, for all of them, whether they're moving around by foot, on bicycle, by bus or by car. But the city's study will take a look at the whole corridor, not just Guadalupe — going a block east into the UT campus and a few blocks west to Rio Grande. Let's start with some potential low-hanging fruit: walkability. Despite being one of the most pedestrian-dense areas in Austin, the Drag isn't a very nice place to walk. "It's just not an inviting place for pedestrians," says Lauren Crestwell, an attendee at a December open house the city hosted to get feedback on improving the Drag. "Nobody wants to kind of go there and stay and have it be a part of their life beyond just traveling through it. So, I think that's a big impediment, a big challenge." "There's a lot of places where there's sidewalk, but it is kind of a desolate sidewalk," he says. "It may be wide, but there's no real attraction for people to go there." So, even though the study is in its early stages, don't be surprised if it calls for major improvements to sidewalks. Think more trees, plants and benches along the drag, an attempt to make the Drag more like Second Street downtown. An annotated map at a recent open house on improving The Drag. 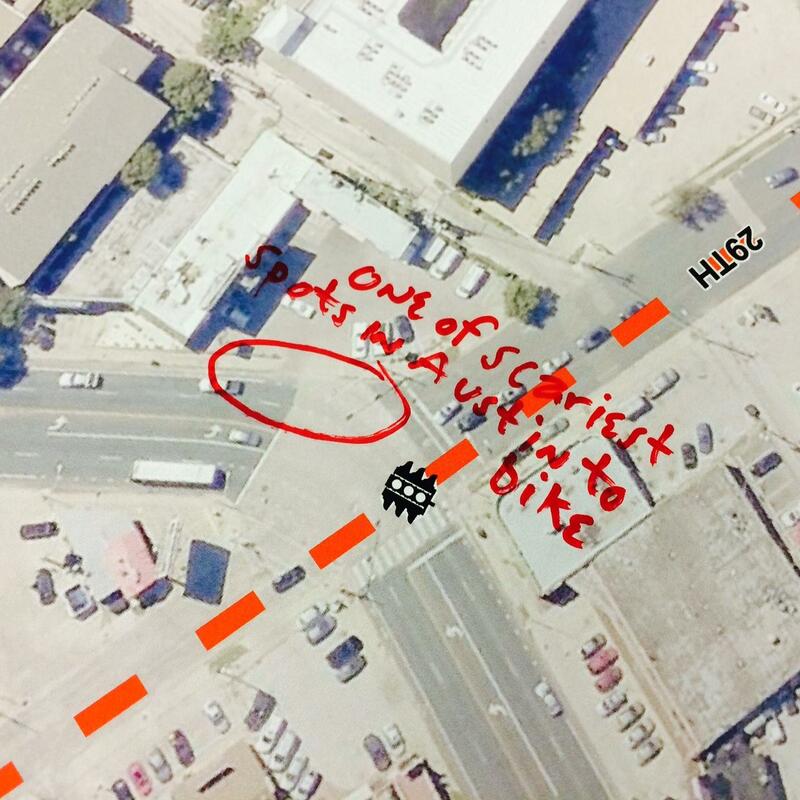 "One of the scariest places in Austin to bike," one attendee wrote of the intersection of 29th and Guadalupe. But all that walkability won't necessarily do much to address traffic on the Drag. For that, let's look at some numbers. AURA has been doing traffic counts in recent weeks on the Drag, looking at how many people are moving through it, what type of transportation they're using, and how fast they're going. What they found matches what the city has said previously: Roughly half of the people moving through the Drag during rush hour are on buses and half are driving cars, but those buses use far less space than the cars. "Trying to carry, let's say, 40 people, in cars is going to take up a lot more space on the road, than if you put those 40 people on a MetroRapid bus, for example," says Roger Cauvin , also with AURA. Yet those buses, even though they're moving more people with less space, are stuck in the same traffic as cars. One solution AURA will push for is extending the current bus-only lanes downtown north through the Guadalupe corridor. However, that creates issues of its own. How do you take four lanes of auto traffic and make two of them bus-only? That's a question the corridor study will look at. One option is to remove on-street parking from the Drag, which is about 70 spaces, and make it a travel lane. While some businesses on the street might be unhappy about that, the city would then have five lanes to work with — two of those could become bus-only, while the other three would be for cars. The three car lanes could even be dynamic ones, which would change direction during the day based on demand. Another option? Move buses off of Guadalupe altogether, like the city has mostly done on Congress Avenue downtown. An analysis of the various options is expected this spring as part of the corridor study, then at some point some recommendations. You can expect there to be some options for cycling improvements, too. Then comes the really hard part – how to pay for all of this? The city's still looking for money to design and build the improvements planned in earlier corridor studies, and is millions of dollars short. So, despite the abundance of options for the Drag, there will likely be some financial gridlock before any solution gets a green-light.